All DEER RIVER homes currently listed for sale in Spring Branch as of 04/18/2019 are shown below. You can change the search criteria at any time by pressing the 'Change Search' button below. If you have any questions or you would like more information about any Spring Branch homes for sale or other Spring Branch real estate, please contact us and one of our knowledgeable Spring Branch REALTORS® would be pleased to assist you. "BRAND NEW HOME!! This charming farmhouse style home features an open floor plan. Gorgeous kitchen w/ white cabinets, gray subway tile backsplash & spacious island. Living room boasts wood beam ceilings & shiplap walls. Master bath is breathtaking w/ His/Hers separate vanities, ceramic sinks, luxury garden tub, separate shower & His/Hers closets. Spacious bedrooms! Decks & paved driveway. Down payment or closing assistance available with qualifying offer. ON FHA APPROVED PERMANENT FOUNDATION!" "Spring Branch rural private country living on spacious 1.16 acre lot with easy access to HWY 281 into San Antonio, Close to Canyon Lake, Guadalupe River and New Braunfels. Fairly new 2048 SF open plan 3 bed 2 bath modular home ready for immediate move in. Compare prices of new. This property presents presents tremendous value. 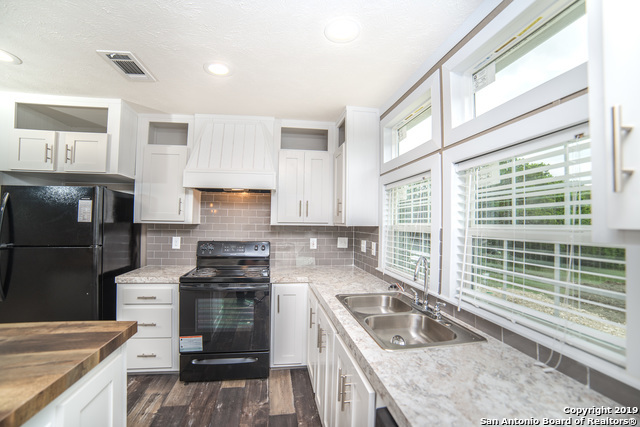 Oversized island kitchen loaded with lots of cabinets, granite countertops, built in appliances including the refrigerator and tile backsplash. CISD Schools"
"BRAND NEW HOME!! 3 bedroom, 2 bath home sits on half acre! The open & spacious kitchen has a large island & huge walk in pantry. Private living area w/ wood beam ceilings & built in entertainment center, spacious laundry/utility room w/ laundry table. Master bath w/dual vanity, garden soaking tub/large separate shower. Decks on front and back. Paved driveway with plenty of room for a car port or shop. Down payment or closing assistance available with qualifying offer. 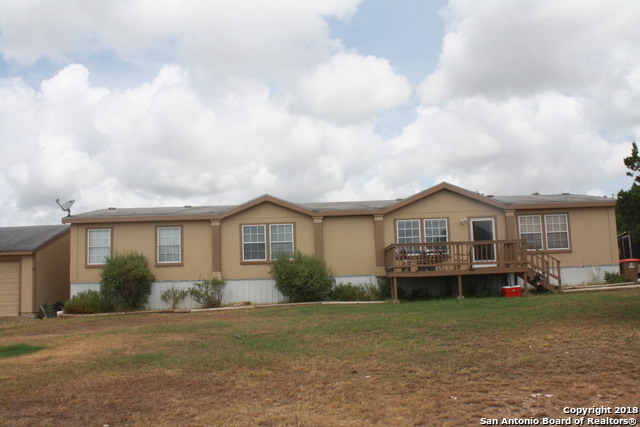 FHA APPROVED PERMANENT FOU"
"Check out this 4 bedroom, 2 bath home just north of Canyon Lake. The home is just over 2300 sqft w/ 2 living areas & large kitchen w/ a breakfast bar. Master bath has large shower & garden tub, separate vanities & walk in closet. The other bedrooms have walk in closets. The guest bath has double vanity that is separate from the shower/tub combo & toilet. This home has been newly remodeled with tile floors in main & wet areas & carpet has been replaced. Finished garage w/ elec. & cable. 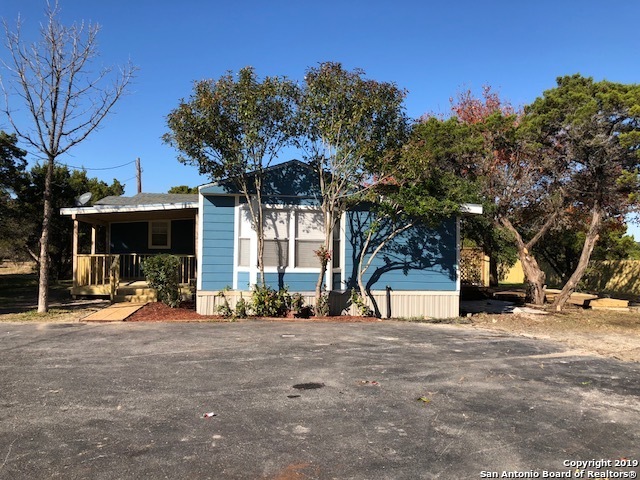 Large dog"
"Freshly Remodeled including newer Roof,newer HVAC,New Flooring (laminate and carpet),New Cabinets,Counter Tops,Decks,Hardiplank,Fencing,Fixtures,Bathrooms,Range and more..This home offers 2 master bedrooms plus office,screened porch covered front and side decks. Located on a HALF ACRE oak filled cul-de-sac lot that backs up to 47 acres for additional peace and privacy. Ready for financing retro fit has already been done Must see to appreciate the quality craftsmanship on this remodel !" "Move in ready, gently lived in home perfectly situated on level lot. FHA retrofit is done. Spacious open floor plan with split bedrooms; refrigerator, washer & dryer convey. Upgrades to home construction include; double pane windows, 7 in. R22 floor & 9.04 in. R28 ceiling. Yard area fenced out back. Central to San Antonio, Austin & Hill Country attractions."